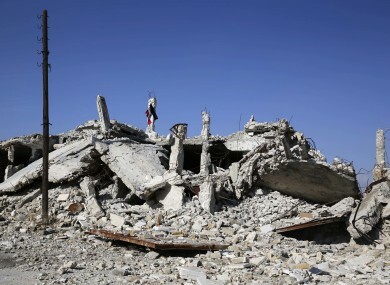 The bodies, according to Syrian state news, were discovered in a rebel-held prison. SYRIAN AUTHORITIES HAVE accused rebel fighters of executing 21 civilians, including women and children, at close range as they quit second city Aleppo last week, state media reported. The bodies were found in two neighbourhoods in east Aleppo, state news agency SANA said late Sunday. The head of Aleppo’s forensic unit Zaher Hajjo told SANA that “21 corpses of civilian victims, including five children and four women, killed by terrorist groups” were examined. “The bodies were found in prisons run by the terrorist groups in Sukkari and al-Kalasseh, and they were found to have been executed by gunshot at very close range,” Hajjo was quoted as saying. Under a landmark deal brokered by regime ally Russia and rebel backer Turkey, 35,000 rebels and civilians left the former opposition stronghold of east Aleppo last week. Days before the evacuations began, the UN said it had received credible reports of at least 82 civilians, including 11 women and 13 children, being executed by pro-government forces in Aleppo. On Monday, the Russian defence ministry said “dozens of Syrians” were summarily executed in east Aleppo by rebels. “Mass graves containing dozens of Syrians who were summarily executed and subjected to savage torture have been discovered,” spokesman Igor Konachenkov said, according to Russian agencies. He said most had been killed by gunshot wounds to the head and many bodies “were not whole,” and that thorough investigations would force opposition backers in the West to “recognise their responsibility for the cruelty” of rebels. The Syrian Observatory for Human Rights confirmed that bodies had been found in east Aleppo’s streets, but could not specify how they had been killed. World powers have been fiercely divided over Syria’s conflict since it first erupted in March 2011, with Russia firmly backing Assad and Gulf powers and much of the West supporting the opposition. The high-profile battle for Aleppo, in particular, has sparked accusations by Western powers that Russia and the government were committing war crimes. Email “Syrian rebels accused of 'executing 21 civilians' in Aleppo ”. Feedback on “Syrian rebels accused of 'executing 21 civilians' in Aleppo ”.